From 323i E46 - compatible with E39 E53. 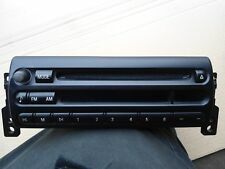 BMW 6 CD CHANGER WITH MAGAZINE. LAND ROVER (LRN50500), (XQE100240), rover 8364931 from cd changer xqe100240. This 6-Disc magazine is compatible with the following CD Changer models RENAULT (MC9RN85Z). FITS BMW MINI ONE, D, COOPER & COOPER S R50 & R53 2001-2006 & R52 2004-2008. BMW MINI GENUINE ALPINE STEREO CD PLAYER. LEICESTER MINI & BMW PARTS. Will fit early L322 models. these are refurbished genuine range rover units. having new loading motor fitted and new laser block assembly if needed. fully tested. Alpine DHA-S690 - 6 Disc Car CD DVD MP3 Auto Changer. Key Features DVD Region 2 Code (PAL/NTSC). Dolby Digital and DTS compatible. 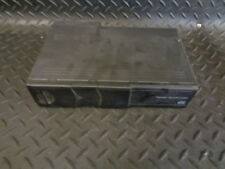 This will fit the following Alpine CD Changers. THE SALE IS FOR CHANGER WITH MAGAZINE PLUS THE LONG 5M CABLE. Alpine DHA-S680P. In original box, complete with all accessories. As new. This unit has been fully serviced and tested. With 6 months warranty. This 6 disc magazine is used but in very good condition. Fits Range Rover L322 and Range Rover Sport models 2010-2012. Suitable forRange Rover L322 and Range Rover Sport models 2010-2012, and Discovery 4 models up to VIN BA999999. They fit, and stay fitted, genuine parts are tested to work perfectly over many years. Mini/BMW 6 CD Autochanger 6946989 from my 2005 Mini Cooper. It should fit any 2000 - 2006 Mini (One/Cooper/Cooper S, R50, R52 or R53). For sale here is an alpine 6 disc cd multi changer from a discovery 2. This is compatible with Becker traffic pro head unit that I also have listed for sale and I will cut a deal if you buy both. 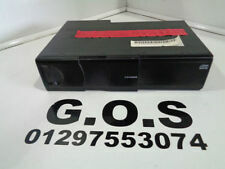 Range rover Alpine 6 disc boot changer model XQE000120 very good condition please check pictures NO RETURNS!!!! Playable Format: DVD-Video, CDDA, MP3/WMA/AAC, DivX. The DVE-5300 is the perfect choice to for adding DVD capability to the X801D-U iLX-F903D, X902D, iLX-702D, INE-W997E46, iLX-702E46 and the INE-W997D. Will fit other cars and is known to work in Facelift XJ40's again with handshake adapter. was working fine when removed but not tested recently. The brackets sorta fit (think they are from a Sony unit) - They are not for this unit but fit fine with two screws and would be fine once screwed into the car. MANY MORE BMW PARTS AVAILABLE. YOUR BMW SPECIALISTS. neutral or. We will always help you to have a 100% positive happy buying experience. BREAKING COMPLETE CAR MOST PARTS AVAILABLE. We will ALWAYS try our best to help. Just as shown and complete ready to fit, hardly looks used to be honest. This is more of a advert to see if this unit has any value to anyone out there. Please message me if your interested. 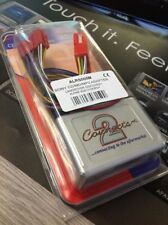 It does not have the additional leads to connect to a car so I can’t test but worked perfectly last time I used it. Not included in this sale but I also have a Genesis four channel amp. Amazing amp, wonderful sound. Let me me know! Alpine CDA 7842R CHA 1204 12 Disc CD Changer Car Audio . Condition is Used. Dispatched with Royal Mail 2nd Class. Used but tested and working. MERCEDES BENZ CD CHANGER. good working any problems. Selling witch holder for MERCEDES CLK 320 COUPE. 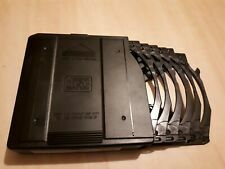 Land Rover New Genuine Alpine CD Autochanger Magazine. Suitable for Range Rover form VIN AA318836, Discovery 4 from AA000001 - BA999999 also Range Rover Sport from AA000000 - BA999999. LAND ROVER - Above & Beyond. Engine: 3.0 TD6 M57. Model: L322 RANGE ROVER MK3. Make: LAND ROVER. We do not decode them prior to sale. All Parts are used and may have hidden faults. We do not cover any garage fees, or any other expenses caused if the item appears to be faulty. We've since sold the car, so have this spare. 1 x used Car CD Changer Alpine XQE000110PMAD 6 Disc Changer, complete with BMW boot mounting bracket. This is compatible with a number of vehicles and this unit was used in a BMW 530d Touring (e39). Just as shown and complete ready to fit, h ashardly been used, see picture of inside of Changer. HERE FOR SALE WE HAVE A FACTORY RECONDITIONED CD CHANGER FOR A RANGE ROVER L322. PART NUMBER FOR THE RECONDITIONED UNIT. LISTED TO FIT CHASSIS RANGE 4A145496 TO 4A999999. SUPPLIED WITH THE MAGAZINE FOR THE CD'S. COLLECTION IS ALWAYS AVAILABLE. Cash on collection is also available. PART NUMBER:65.12-6913389. L322 2003 4.4 V8 Petrol. We Are Breaking an Entire L322 Vogue 4.4 V8 With LPG Conversion. Isle of Wight: PO30-PO41. 6 CD Multi Changer. Range Rover Vogue. Good Working Order. If a part has been correctly supplied in good working order and is no longer required. All have been tested prior to removal. 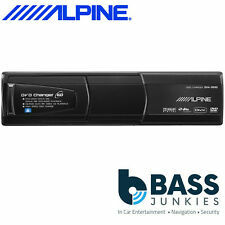 6 disc CD changer - Alpine CHM-S630Here’s an affordable way to add more listening choices to your existing system. This compact, easy-to-install changer lets you select up to six CDs and CD-Rs right from a M-Bus head unit. FREELANDER 1 UNDER SEAT CD CHANGER. GOOD WORKING ORDER ..NO CASSETTE. Collection is not a problem we will require notice of collection. Second hand parts may carry age related scuffs or storage marks etc. Removed from a 2005 Bmw E46 318ci convertible and in full working order. The CD changer itself should be suitable for various other Bmw models. This also still has the mounting bracket for the E46 convertible shape so is ideal if you don't have anything where yours should be. The connectors and a small piece of loom are still present should you need them. If you are unsure of compatibility please check beforehand as part numbers are in the pictures. Oem part in good working order. Nb. Does not come with CD cartridge as we sell these separately.